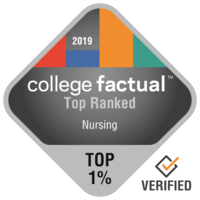 2019 Best Nursing Colleges in the U.S. Nursing is a very well-known major with 165,168 graduations annually. It is rated 2nd most common out of the 384 common majors offered at U.S. schools. Students who graduate with a Nursing degree have a 6.0% boost in salary when compared to other college grads. This means the degree is ranked 34 out of 121 with respect to income potential. Nursing graduates will earn an average of $53,333 for their starting career pay and $70,116 for their mid-career pay. Below you'll see a list of the best colleges and universities to study Nursing. Our ranking methodology takes into account education quality, average earnings of graduates, accreditation, and several other relevant factors. The best school in the United States for Nursing is Molloy College. At Molloy College, 41.7% of undergrads major in nursing. Situated in Rockville Centre, New York, Molloy supplies a safe and sound, suburban atmosphere for young people. Molloy College features a low crime rate, among the list of the most safe in the U.S.. Molloy College does not require freshman students to live on-campus. Want to learn a little more about Molloy College's campus? Take a virtual tour. New York University is among your top options if you want to study Nursing. New York University offers graduate degrees in nursing for those interested in an advanced degree. The location in a major city is great for scholars trying to find adequate opportunities for social networking, adventure, and exploration. Drexel University is a great option for individuals interested in a Nursing major. Drexel University offers graduate degrees in nursing for those interested in an advanced degree. The surrounding area of a big city is great for students seeking out considerable chances for social networking, experience, and exploration. This school offers graduate degree programs for those who need to keep going after earning a four-year degree. Around 78.0% of Drexel University students are given some form of school funding. The scorecard will give you a great summary of Drexel University. Simmons College is a great option for students pursuing a Nursing degree. After graduating, nursing students typically make an average of $61,693 in their early careers. Boston, Massachusetts is an excellent environment for individuals who relish the fast-paced urban lifestyle. Applicants should not let costs stop them from applying to Simmons College since 94.0% of undergraduates receive school funding. Simmons College graduates are doing well in the world as they are less likely to default on their loans than graduates of other schools. A virtual tour could be a good way to learn more about Simmons College. University of Detroit Mercy is among your best bets if you want to study Nursing. A preferred major for undergraduates, there are about 338 learners enrolled in this program at UDM. The setting in a large urban center is wonderful for young people trying to find adequate options for social networking, excitement, and discovery. Strong assistance for student veterans has earned University of Detroit Mercy a high rating. There is a grad program obtainable for students who are intrigued. Learn more and discover just how well UDM ranks in other categories. Villanova University is a good decision for students pursuing a Nursing degree. This is quite a common major at Villanova, with 12.3% of undergraduates signed up for it. Situated in Villanova, Pennsylvania, Villanova provides a dependable, suburban environment for students. Considering that 7.0% of college grads have defaulted, Villanova's default rate of 1.3% is impressive. Many Villanova first-year students receive scholarships. For details, look at college scorecard. Quinnipiac University is among your top options if you want to study Nursing. Nursing students from Quinnipiac University get a earnings boost of approximately 15.1% above the average earnings of nursing graduates. Situated in Hamden, Connecticut, Quinnipiac supplies a comfortable, suburban environment for college students. The campus at Quinnipiac University is highly diverse and includes undergrads from across 30 U.S. states and 31 nations around the world. Quinnipiac has a leading women's basketball team. In what areas is Quinnipiac University doing the best? Take a look at all the school rankings. It's difficult to beat George Washington University if you want to pursue Nursing as a major. Students who graduate from the nursing program earn about $64,249 in the first five years of their career and $91,583 after their first five years of their career. Washington, District of Columbia is an excellent setting for college students who get pleasure from the active city life. Any student who is interested in Nursing needs to take a look at Azusa Pacific University. Students who graduate from this program report average early career earnings of $67,411 and mid-career earnings of $86,231. This school is located in the suburban area of Azusa, California, close to shops and other entertainment. Azusa Pacific has earned a top position for quality of education delivered to veterans and military personnel. Azusa Pacific features a high performing men's basketball team. Take a virtual tour for more information on Azusa Pacific's campus. Every student who is interested in Nursing needs to check out University of Pennsylvania. University of Pennsylvania offers graduate degrees in nursing for those interested in an advanced degree. University of Pennsylvania is among the largest schools in Pennsylvania.